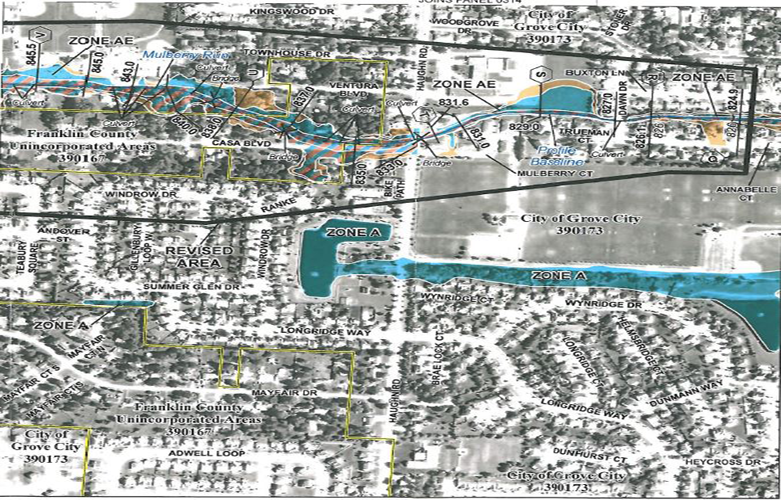 The Federal Emergency Management Agency (FEMA) has issued a Letter of Map Revision (LOMR) based on the City of Grove City’s recent study of Mulberry Run. The LOMR, effective March 12, 2015, indicates changes to the floodplain boundaries along Mulberry Run. Following the 2008 map modernization for Franklin County’s Flood Insurance Rate Maps (FIRMs), the City contracted the engineering firm of EMH&T to perform a study to gather more accurate information regarding the potential for flooding at various locations along Mulberry Run. New base flood elevations and floodplain boundaries were determined by the study and will become official Thursday, March 12. As a result of these changes, some properties currently within the floodplain will be removed, while other properties now outside the boundaries will be within the floodplain. After March 12, letters will be sent to affected property owners explaining the effect of the LOMR. Copies of the LOMR will be provided upon request to homeowners, lenders or insurance agents to confirm flood zones for insurance purposes. Download the Mulberry Run LOMR or visit the Floodplain Management webpage for more information. For more information, contact the Grove City Building Division at 614-277-3075.